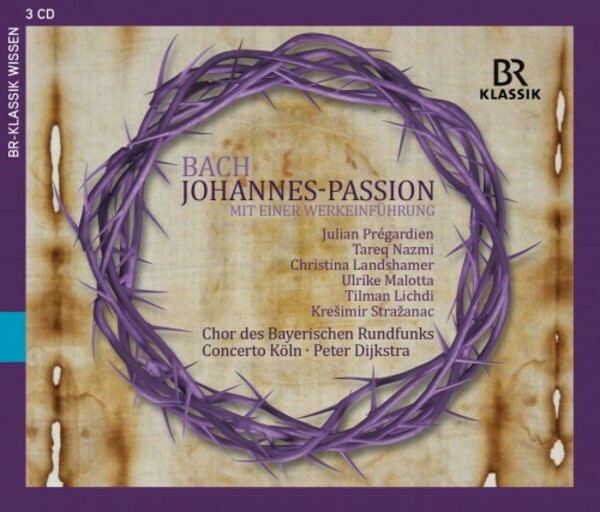 The music of Bach's St John Passion, which the composer wrote for Holy Week in 1724 immediately after his appointment as cantor of St Thomas's Church in Leipzig, still retains all its freshness and vitality nearly 300 years later, and is a true Baroque delight. The two main choruses 'Herr, unser Herrscher' and 'Ruht wohl, ihr heiligen Gebeine', form the beginning and culmination of a large-scale orchestral and vocal structure in which Bach reveals his absolute mastery of polyphony. Inwardly reflective chorales are as much interwoven into the events of the Passion as the haunting arias which comment on the biblical texts of the Gospel of St John. Throughout this solemn Passion oratorio, there is a constant emphasis on Baroque musical magnificence. What makes this live recording of the concert of 7 March 2015 in the Herkulessaal of the Munich Residenz so special? The fresh voices of the young and excellent vocal soloists, the regularly praised 'astonishing three-dimensionality' and 'crystalline clarity' of the Chor des Bayerischen Rundfunks under the direction of Peter Dijkstra and, of course, the renowned period instrument ensemble Concerto K�ln. This is a recording of Bach's 1749 'fair copy' of the St John Passion.